On the bookshelves of the contemporary young and not-so-young college-educated modern Orthodox Jew, one most often will find the theological works of Rabbi Joseph B. Soloveitchik and his esteemed son-in-law, my revered teacher, Rabbi Aharon Lichtenstein, both of blessed memory. On another shelf one will probably find works of Rabbi Norman Lamm, the former president of Yeshiva University, as well as the increasingly popular (in both senses of the word) writings of Lord Rabbi Jonathan Sacks. On another shelf one also may find some writings of Rav Kook and in some instances the newly translated works of Rav Shagar. These thinkers rightly occupy a pride of place in the pantheon of modern Orthodox thought leaders. The dominance of these voices, however, sometimes has come at the price of relegating other significant voices from the 1950s to the 1970s that contributed significant ideas to our thinking about the engagement of halachic Judaism and the modern world. On the cover of Martin Bodek’s new book about Passover, three small pictograms set against a stark white background catch the reader’s attention: a man speaking, a sea shell and a ram. Faith and Freedom Passover Haggadah presents selections of the writings of Rabbi Eliezer Berkovits, one of the major Jewish philosophers of the twentieth century, as a new and meaningful commentary for the Passover Haggadah. The Seder night experience will be enriched with the reading of the traditional telling of the Exodus along with Rabbi Berkovits’ insightful and refreshing ideas that address crucial topics for the modern era. To be sure, “The Emoji Haggadah” is more of a game than a haggadah, but it will surely engage the lively interest of younger participants and enliven the seder for everyone even if, on the other hand, the challenge of decipherment isn’t going to make your seder any shorter. But, just as the Rosetta Stone was the key to decoding Egyptian hieroglyphics, the author provides some helpful tips for translation as well as the complete text of a traditional haggadah in both Hebrew and English. The wisdom of an author can reach into your heart and mind, shaping your views and changing your life. It is not uncommon for people to read all the works of a writer they admire. But Dr. Reuven Mohl went further after becoming dedicated to the teachings of Rabbi Eliezer Berkovits. Dr. Mohl, who lives in Teaneck with his wife and three children, has just edited and published “Faith and Freedom Passover Haggadah” (Urim Publications), where he linked passages of Rabbi Berkovits’ writings as commentary to the Haggadah text. It’s the illustrated Haggadah like you’ve never seen it before, and it’s bound to cause conversation at your Seder. 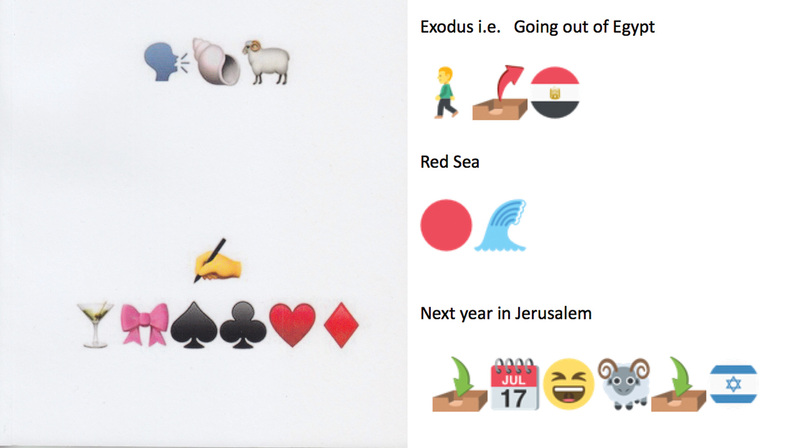 Coming out just in time for Passover, author, IT specialist and language-lover Martin Bodek of Passaic, NJ has created a Hagaddah using only emojis. With certain pictograms placed together in a specific order, the reader gets the story of the Jews leaving Egypt without ever reading a word. You are currently browsing the archives for the Canadian Jews category.